Ever performed a search or filter on one page, left the page, then returned only to have to perform the same search or filter again? We have, and yes it's annoying. Today we're happy to announce a feature which will eliminate this issue. Tokeet will now save all searches and filters on almost every page. When you perform a search or filter on your inbox, navigate off to the booking detail then come back, your filter selections will still be there. Even if you log out of Tokeet then sign back into the same browser tab your searches will still be there. The same goes for almost every page where search/filter exists. We hope this will make your lives easier and make Tokeet a bit more user friendly. We love spending time analyzing how users interact with Tokeet, and trying to put ourselves in the mind of the user. We gather every bit of information we can about user interactions and navigation paths. With this information we try to formulate new ways to make Tokeet even more user friendly. This was the genesis of our new inbox, which we hope will increase your productivity for the majority of use cases. The Advanced Inbox condenses a number of different pages into one seamless experience for quicker utilization. 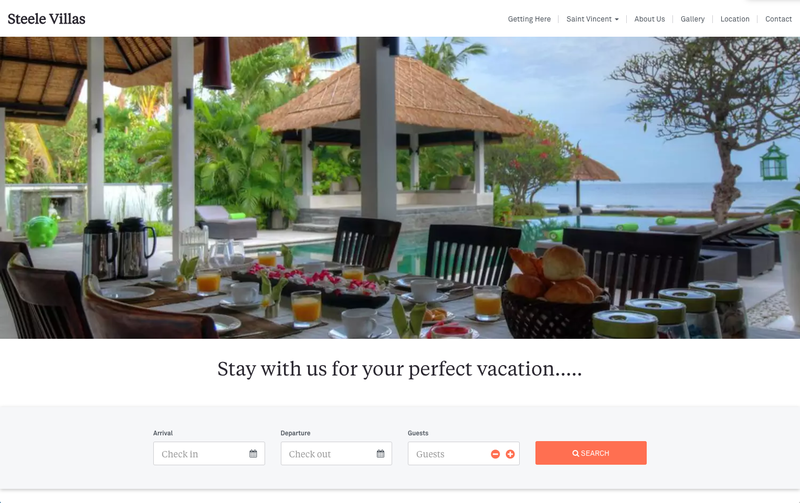 You can quickly view and send messages, view and update booking details, and update guest details all from one screen. No more navigating around to get things done. You can get to the Advanced Inbox by going to your current inquiries inbox and clicking the yellow Action button, then selecting Advanced Inbox. If you like the new inbox then you may make it your default by selecting the Default Inbox option above the inquiries list on the Advanced Inbox page. 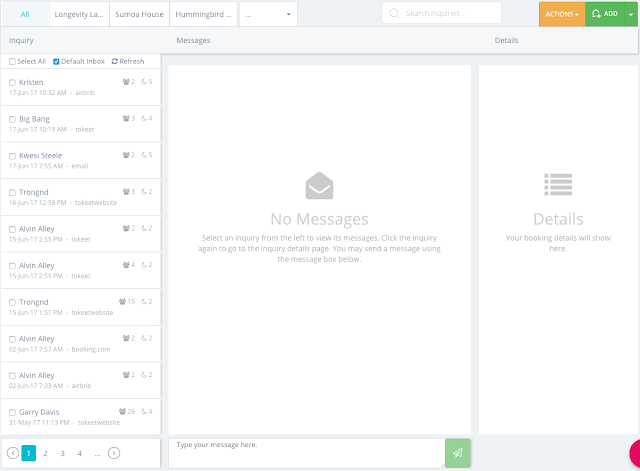 We would love your feedback on this new inbox so let us know if it makes your life easier and how. Many clients across the globe have asked us for more features to help them better manage their owners. For those agencies that manage properties for property owners, communicating with property owners and letting them know how their properties are performing consume a tremendous amount of time. Well, we heard you loud and clear and are excited to announce improved owner management features. You can now create owner statements and owner invoices directly within Tokeet. Also, using the newly released Payout Rules, you can create payout formulas for each booking you receive. These formulas get automatically applied when creating a new invoice or statement for an owner. So you can say goodbye to spreadsheets and human errors. A payout rule is an instruction to Tokeet to calculate a specific payout, or payable amount, for each booking. Payout rules apply to bookings which match the rule restrictions. So, if you want a different payout amount for different owners, or different channels, or different rentals, etc you may create a rule for each case. Tokeet will then find a matching rule for each booking depending on the bookings rental, owner, or channel when you are creating an invoice or statement for an owner. Owners may also pay their invoices online if you have a connected payment gateway. You may also now enable or disable any section of the owner's dashboard. So if you don't want your owners to access reports you may simply disable it. Owners also have a customized view of their bookings and revenue each month, however you may also disable this new view if you like. Our newly upgraded owners module will shave hours off your workload each month and help you scale your business effortlessly. A new rental selection table that makes assigning rentals to your website easier. A new wysiwyg web page editor for your custom web pages which allows you to embed images, video, tables, and much more. It also has a cool fullscreen mode. A website image library for saving images specific to your website. You can also set a main website image and favicon. 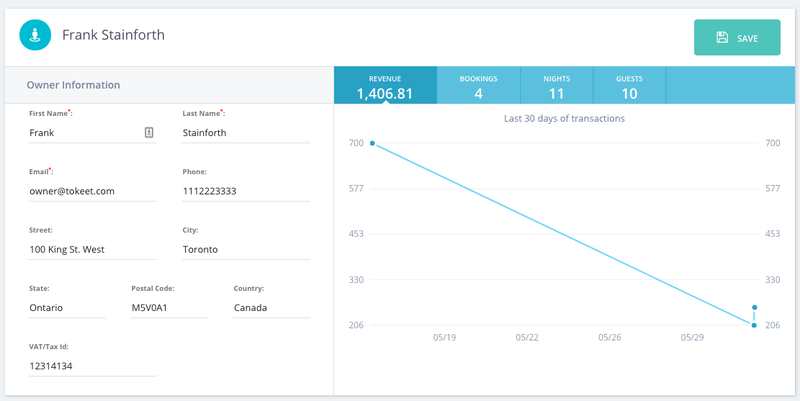 Google Analytics and Mixpanel tracking built into every site. Simply enter your analytics IDs into the dashboard. Turn on and off any section of the web site with one click. Embed custom CSS, and Javascipt via raw code or library URLs. This powerful feature allows you to customize any part of the website using your own style sheets. We're truly excited about this update to our website builder, which is the first in a series of updates we will be making to this product. Stay tuned for online bookings coming in a few weeks. Here's a mock website I created in about 10 minutes.